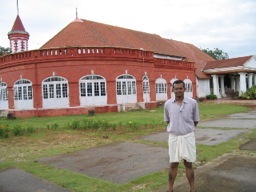 A picture of myself taken at Kanakakkunnu Kottaaram (Palace) in Thiruvananthapuram during my vacation in 2004. Prospective employers may view/download my resume. President & CEO of Sans Pareil Technologies, Inc. Developer of BSON C++ API. Lead developer of EchoPoint component library for Echo3 AJAX web development framework. Developer of SPTWebMail AJAX webmail application. Developer of SPTRWT AJAX relational database management application. Developer of SPTODB object database engine. Developer of SPT JCR Manager application for managing Java Content Repositories. Developer of JCR CMS application. Developer of iPhone Sudoku game for Kamicom. Developer of Music Festival, Voodoo Experience, French Quarter Festival, Chicago Blues Festival applications for Applitite. Developer of Google CTemplate Editor/Viewer. Developer of Movie Player application. Board member of Chicago Java User Group from 2007-2013. President for 2008/2009. Google DataStore presentation at CJUG. JackRabbit configuration presentation at CJUG. Java Content Repository (JCR) presentation at CJUG. iPhone SDK presentation at CJUG and UniForum Chicago. Object Databases presentation at CJUG. Echo2 web application framework presentation at CJUG. Develop libraries and applications for Arduino. Owner of Sans Pareil Technologies, Inc.